June 15, 2015. Everybody warned me it would happen. I’ve read articles in preparation for it: culture shock — the moment when the move to a new country stops being filled with wonderful discoveries and instead becomes about combatting daily little irritations. You know what I mean, when people behave in baffling ways quite different from the familiar traditions of your home country, and you run short of patience in trying to rationalize such contradictions. Yes, I know that the persistently cold and rainy days (plus my recent battle with clothes moths, which have infested every square inch of our apartment), have drained my reservoir of good humor and taxed my coping mechanisms. And so, in hopes that the mere act of venting my frustrations will help restore my equanimity, please forgive me for this whining post. And please excuse the lack of images; it’s impossible to politely document annoying behavior without inciting anger in the subject being photographed. Southern Manners Vs. Social Mayhem? My initial descent into a lousy attitude began with periodic observations of what I called “bad manners.” Yes, I know I’m a U.S. Southerner at heart, which means I’ve been raised with a strict social code of excessively chatty politeness and overly effusive gentility. But believe me, I’ve now gotten used to self-absorbed behavior on the streets of Chicago where I’ve lived for the past 20 years. I had to laugh when my cousin Colby, who hails from my home town in Kentucky, recounted his visit by saying, “I don’t like Chicago. Them people ain’t friendly ‘t’all. They don’t even say howdy to ya on the street.” Nope, publicly greeting strangers isn’t common in Chicago, but neither is blatant and seemingly purposeful rudeness. Note how randomly people enter and exit this tight tunnel. No such thing as keeping to the right to facilitate traffic flow. Same thing with double doors. Using the right door for entering a building and the left to exit is also often ignored. But one day, after a particularly rough trip to the office filled with multiple instances like those cited above — including one woman who seemed intent on deliberately (and successfully) blocking me from entering the train — I wondered to a colleague if I was somehow irritating people by not knowing hidden cultural protocols regarding public traffic flow and checkout-line etiquette. And it’s true, I’ve experienced several encounters where I’m the only one on the street, and a Norwegian comes towards me from the opposite direction. I move to the right, thinking that he or she will move to his or her right and thus avoid a collision. Instead, he or she continues to veer into my pathway until I’m literally pushed off the sidewalk. This once happened in a store with a woman who ended up physically bulldozing me with her shoulder all the way into a rack of clothing — even though the entire 20-foot-wide shopping aisle was completely free of other obstacles. The weirdest part is, even if I eventually give up and change direction, the other person usually looks right at me and swerves to meet me until we collide and are forced to perform a comical pas-de-deux to untangle ourselves. In the end, there’s usually lots of persistent pushing and angry “harumphing” on the part of the Norwegian, as if he or she doesn’t understand that I’m a solid object and is frustrated that I just don’t simply evaporate out of the way. I always apologize and excuse myself, but never once have I received an unnskyld (“sorry”) in return. It appears that Norwegians are quite loath to admit a navigational error. When is Going Left Right? Anyway, this latter theory of perceived left and right might explain why, every single time I ask directions of someone on the street, they steer me exactly opposite of my intended destination. I refuse to believe that all Norwegians are “just messin’ with me” because I’m a foreigner. And considering that Norwegians were the first to accurately locate and arrive at the North and South poles, I can’t imagine that they have as poor a sense of direction as I do. I honestly think that somehow the notions of “left” and “right” get jumbled up in the translation from Norwegian to English when it comes to sidewalk negotiations. In other words, from the perspective of where my guide is standing, it’s their right, but my left. A friend of mine has another hypothesis. 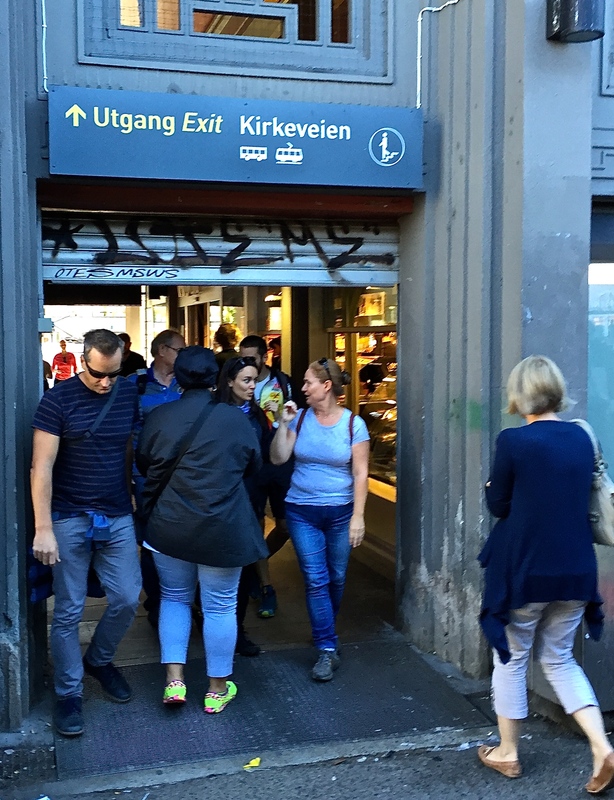 She believes that these kinds of public right-of-way politics just aren’t firmly established because, since the population across Norway is so small, folks don’t usually encounter throngs of people in face-to-face confrontations on the streets. (Norway’s entire population measures only 5.2 million — less than Chicago’s Cook County — and most folks live in rural areas and small towns.) My friend speculates that Norwegians haven’t developed rigid pedestrian-traffic-flow customs such as “keep to the right” because they don’t regularly encounter intensely crowded sidewalks — except on Norwegian National Day (May 17th), when the copious amounts of liquor imbibed by all make navigating the drunken hordes that clog the street more like a game of life-sized pinball. Her theory seems to be born out in pinch points like pedestrian tunnels, where I routinely watch Norwegians weave haphazardly through the pack of commuters rather than sticking to one side of the passageway. Frequent collisions result in an irritable jockeying back and forth for ten seconds until the participants have achieved some sort of decision on which direction each offender will proceed. It really is like watching the random meanderings of hens in a chicken yard. Everyone’s trying to go somewhere in a hurry, but no one has a clear idea of how to get there unimpeded. But undefined traffic patterns don’t really explain other rude behavior, like jumping in front of me just as the train or bus doors open, shoving me out of the way to place an order for coffee before me, breathing down my neck while I’m trying to pay, taking food out of my hand in the grocery store, and letting doors slam in my face. And it doesn’t clarify gym politics. For example, why — when there’s an entire row of unused treadmills, ellipticals, showers, or hairdryers available — does a Norwegian either push me out of the way to claim the one I’m headed to, or cozy up right next to me and glare at me as if I’ve claimed the best for myself? My colleagues of other nationalities have complained of the same thing in the gym right across from our job site, so I know it’s not just me or my particular facility. 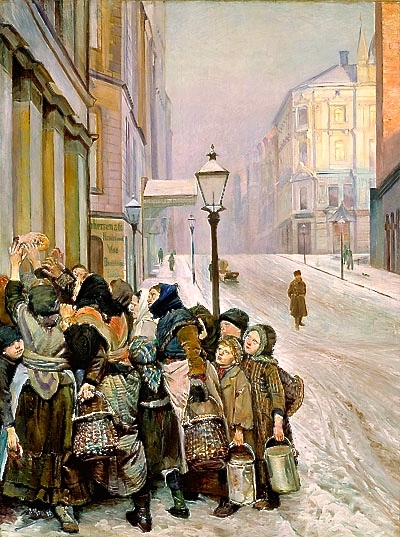 “The Struggle for Existence” shows a bakery distributing bread to some of Oslo’s poor in 1888. It was painted by famous Norwegian artist Christian Krogh, who depicted many such scenes of Norway’s enormous, poverty-stricken lower class. Notice how the children have been pushed to the back of the line, and the adults fight for the one loaf of bread being offered. I’m now working hard on developing a theory for this behavior. It wasn’t that long ago that Norway was exceedingly poor. Several paintings in the National Gallery depict crowds clamoring for food in Oslo, much like the bread lines of Eastern Bloc countries during the Soviet days. Maybe it’s not stretching things too far to think that in such times, people developed a “Me First” mentality just to survive. And perhaps putting this assertiveness aside takes more than the 25 years or so that have passed since oil discoveries made the country wealthy. On the other hand, some of my colleagues think that it has more to do with recent prosperity, where younger Norwegians have developed an attitude of entitlement not so different from many millennials in the United States. 1. The Checkout Clerk: At the grocery store, I paid for purchases with my credit card. (Norway is hoping to phase out cash eventually, so they prefer payment by card.) Turns out, I had accidentally put the card in the wrong slot in my wallet, but when I went next door to buy flowers and couldn’t find it, I rushed back to the grocery checkout to see if I’d left it there. As I looked around, the cashier came back and I explained the situation. She searched for a moment, and then started yelling at me, “I don’t see it. It’s not here. Why did you leave it behind? That was stupid of you. If you would have told me you were going to leave it behind, I would have reminded you.” I responded, “Let me get this straight. You wanted me to tell you that I was about to forget my card, so that you could remind me not to forget it?” She glared at me, then stalked off. 2. The Delivery Guy: The airlines lost one of our bags, which unfortunately had the charger to my phone in it. Since the driver couldn’t call me to let me know he was approaching with the recovered luggage, he’d been instructed to call Matthew ten minutes prior to arrival so that Matthew could notify me via email. Everything went well, until ten minutes had passed with no buzz on our intercom from the driver to let me know he’d arrived. Finally I ran downstairs to wait outside, where the driver was just pulling away. I took him to the front door and pointed to the buzzer label in 18-point capital letters: BECK / SMITH SINGLETON. No apology, he then insisted that the label should have instead read “2A.” I pointed to the building’s address signpost, “2A is our street address, not our unit number. Why would I put the street address on my security buzzer? By the way, we don’t have unit numbers in our building, only floors with personal names.” In a heartbeat, he went right back to berating me about leaving my charger in my purse. 3. The Waitress: At a restaurant in downtown Oslo, we ordered food, and the cashier asked us where we were sitting. Since we responded “outside,” she told us to come back to the counter to pick up our food in ten minutes. Ten minutes passed; no food on the counter. Five more minutes, no food. Matthew had to visit the men’s room, so I decided to wait at the counter for the food. The cashier came up to me, plate in hand, and began screaming, “Is this your food? Do you expect me to look all over the restaurant for you to give you your food? I’ve wasted five minutes searching for you! Don’t you know I have better things to do?” All of this was screamed so loudly that the entire restaurant full of people grew completely silent. I apologized for the inconvenience, reminded her of our original conversation, and explained how we’d tried to follow her instructions, but she shouted me down and delivered another five-minute lecture about my ineptitude and general stupidity. I wish I could say that these were aberrations, but truly, I encounter or witness some sort of public reprimand like this about once a week. Many of my colleagues have experienced the same thing, so I know I’m not alone. One co-worker who was out skiing had a stray dog follow him for a while, and when it squatted for a poop, a group of Norwegians gathered to chastise him for not cleaning it up, even though he explained it wasn’t his dog and he didn’t have a plastic bag handy. Another friend of mine was sitting at a coffee shop when a Norwegian guy passing behind her slipped on the newly mopped floor and doused them both with hot coffee. He began yelling at her for making him spill his cup, even though she was seated and he was the one in motion who’d slipped. 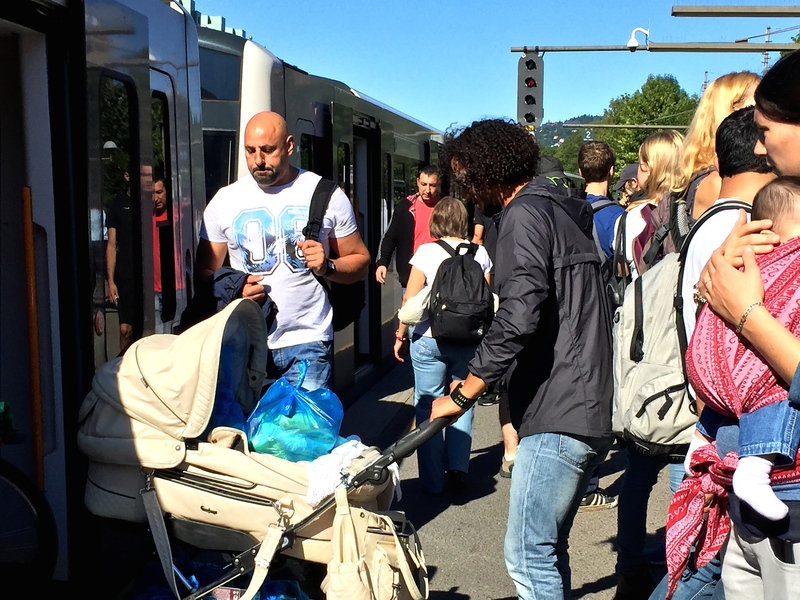 It’s weird for me to see parents struggling to get a baby carriage on or off the train — and no one steps forward to help them. Maybe that’s why Norwegians hate admitting a mistake — for fear they’ll receive their own public dressing-down. I had a Norwegian acquaintance explain to me that there is actually no phrase or word for “excuse me” or “pardon me” — there’s only unnskyld (loosely meaning “sorry,” but literally translated as “treat blame”), which Norwegians are loath to use. When I asked him why, he said, “For two reasons: why disturb someone that you’ve bumped into and already bothered by then talking to them? And anyway, saying unnskyld implies someone has made a mistake, when it might be just an accident that’s no one’s fault.” In other words, such chattiness is considered being rude and even further disruptive after having accidentally collided with someone. To understand the nuances behind typical Norwegian pleasantries, I looked into the details of the two most commonly heard phrases — værsågod and vær så snill. As it turns out, Værsågod doesn’t really mean “you’re welcome,” but rather, “be so good,” as in “be so good as to accept this plate of food.” Just as vær så snill, commonly translated as “please,” actually means “be so kind,” as in “be so kind as to pass me the salt.” Except that Norwegians typically reach over your plate to get the salt themselves — a custom nicknamed “getting the Norwegian arm.” I’ve frequently had folks reach over my head or across my plate to retrieve whatever dish they’re aiming for because it’s considered rude to interrupt someone’s meal by asking them to perform a personal task for you. It also seems that both vær så snill and værsågod are seen as somewhat formal and stilted phrases. Apparently they’re best reserved for more ritualistic occasions and are not expected to be regularly used, even between folks who know each other well, unless something special demands it. Another Norwegian colleague explained that, since there’s no real word for “excuse me” that doesn’t imply blame, it has become the fashion to say bitte schön, which isn’t even Norwegian. It’s German, and it’s commonly used to mean “you’re welcome” in Germany (although its literal translation is “please pretty,” like our “pretty please.”) I’ve mostly only heard this phrase used when someone is trying to get my attention to ask a question. Only rarely have I heard it used by someone who wants to pass another pedestrian on the sidewalk. Usually the person just bumps, shoulders, or elbows their way around others without acknowledging the interaction with even so much as a backward apologetic glance. Again, the moral of the story is to get to where you’re going without annoying someone further by talking to them or engaging in the self-blame game. That brings me to one more social lesson. On several occasions I’ve witnessed someone skid and fall on the ice or take a header on their bike after getting a tire stuck in the streetcar tracks. When I’ve run to help them, they’re usually angry and push me away. It’s as if they’re embarrassed to have been caught making a mistake. I’ve now learned that the perceived “polite” way to handle a situation like this is to avert your eyes, thereby saving the person the humiliation of being aware their faux pas has been witnessed. Only if they lie prone for a while or show signs of being unable to recover is it socially acceptable to offer aid. It all feels quite odd and cold to me, but I keep trying to remind myself that it’s just a different perspective on what constitutes “good manners.” I’m trying to adapt my cultural framework to a different point of view. Often you’ll hear Norwegians joke that they prefer much more personal space than the average European, but I’ve found the complete opposite to be true. Yes, when you enter a bus or streetcar, folks often do try not to sit next to strangers. But in most other situations, I find that Norwegians go out of their way to cozy up next to me. In my gym class, a Norwegian will often insist on wedging in their Power Step right in front of me rather than placing it anywhere else in the virtually empty room. And when I’m approaching the store checkout counter, a Norwegian will frequently crowd closely behind me or even rush to cut me off at the pass, even though there’s no one standing at the open counter literally right next to the one that I’m headed towards. Again, totally confusing public politics, but I think I’ve just had a minor revelation. I’m wondering if Jante’s Law of conformity explains why folks go out of their way to wander into my path or cuddle up next to me in at the same gym showerhead. Maybe Norwegians are just more comfortable in public places when operating as a group. I’m told that most schoolwork involves large group projects, and children are graded less on their individual performance and more on their ability to collaborate with others. So maybe when in certain settings, folks feel pressure to gravitate towards each other to form a consortium. I’ll give you an example. Matthew had an experience the other day where he was running to catch the Trikk (the streetcar). Another guy twenty feet away, who was headed to a different door, suddenly changed direction and sprinted to get right in front of him — literally passing up two other doors that would have provided entry into the same exact car that Matthew was entering. Same thing happened when getting off the Trikk. As Matthew prepared to exit, a man and his daughter abandoned the exit stairs they were about to head down, ran down the aisle, and shoved their way in front of Matthew to use the same stairs he was using. Maybe in both cases, these folks were most comfortable being part of a herd. And maybe, when they saw that Matthew wasn’t moving to join them, they thought that he knew something they didn’t know — like which side was the “correct” side or which door wasn’t working — so they moved to join him. Just a thought. So all in all, if I were to construct a model about what governs Norwegian social behaviors, I’d say two philosophies seem to be constantly battling to create balance. Perhaps past poverty and hardship have driven home the lesson that an individual’s survival requires a certain selfishness. But living in a cold, harsh, and underpopulated environment has reinforced the need for interdependence and cooperation as vital to the survival of a community at large. Hence, Jante’s Law emphasizes that “the needs of the many outweigh the needs of the one,” while internal instincts stress the opposite viewpoint, “I must take what I need to live, because my needs outweigh those of the group.” So maybe conformity and safety in numbers, and yet the need for individual accomplishment, are at constant war with one another. And maybe I’m witnessing these two opposite social constructs duke it out daily on the streets of Oslo. In the end, I am convinced that the key to living in another country is learning the reasons behind why folks persist in behaviors that can sometimes seem irritating to a foreigner like me. Evolution tells us that all behaviors are adaptations to environmental pressures — in other words, a behavior won’t be perpetuated unless it serves a functional purpose in society. So when one of these inexplicable moments of apparent rudeness happens to me, I’m trying really hard to check myself and remember that it’s not personal or intentional. And it’s not a dominance thing; it’s just the cultural perceptions of politeness in play. And I mentally walk myself through the potential psychologies of the situation so that I don’t get really steamed. I honestly do believe it’s my responsibility as a guest in this country to uncover the reasons for patterns that I find frustrating and perplexing. My goal is to practice greater patience and learn to better tolerate and even appreciate our differences regarding etiquette and manners. After all, I’m sure lots of bizarre American behaviors mystify Norwegians who come to visit the States (or watch American reality TV). So if you’ve actually finished my long dissertation, thanks for bearing with my complaints. I’m sure I’ll get over it soon. A little more sunshine, a few weeks with no moths, and a little more reading about Norwegian philosophy will soon have me feeling more charitably inclined. Cross your fingers. I have lived all my life in Norway and never experienced anything like this, just let me say that we are not rude, we have no need of humiliating other people and we do apologize. There are always some bad eggs, don’t let them count for a whole population. So for another ‘Newbie in Norway’, don’t let this text affect your perception of norwegians. Hi Isabell. I’m so sorry to be just responding to your comment — somehow the system never pinged me that you’d written, and I just discovered your note in my old cache. Please know that I would never in any way want to discourage someone who is considering moving here. I absolutely love Norway, and I count myself extremely fortunate to have the opportunity to live here! I wrote this post about six months after immigrating, when I was dealing with culture shock and the differences between our customs, which had crept up on me unawares and surprised me. (In so many ways, Norwegians and Americans have lots in common, so the unexpected differences rattled me a bit.) That doesn’t mean I haven’t since encountered similar experiences to those I first described in my post. But now, after two years here, I have a better understanding of protocol, and I don’t get so discouraged and overwhelmed by such moments, or take them personally. This is very interesting. I live in Japan and since I always like being on my own I have always been kind of scared of their tendency to emphasize groupwork at schools, work etc. I was kind of resorting to mental fantasies abouy Scandinavia when feeling tired of Japan, but realistic articles such as yours help me realize that nowhere is perfect and, whilst the reasons might be different, group mentality exists and prevails in those countries that everyone here idealizes, too! Weird but it serves as a consolation of sorts and an incentive to look on the bright side. Hi Anna. It’s funny, because my husband and I have often discussed the cultural and societal similarities between Norway and Japan. Beyond the obvious love for raw fish, minimalism, and other architectural affinities (wink, wink), both countries do seem to emphasis conformity, group work, and an adherence to enduring pain and even perpetuating certain hardships in life order to strengthen character. The same thing happens here in Norway. Many Norwegians own mountain hytter (huts) that appear log cabin-ish and quite modest on the outside, but are “blinged out” on the inside like something from Architectural Digest — except that they have no indoor plumbing, central heating, or electricity, because that would be “soft” and considered outside the acceptable norm for Norwegian society. It’s almost like a yin/yang balance between luxury and austerity. Regarding children, some of our teammates who’ve had babies here have been shocked when the visiting nurses (sent by the hospital after childbirth) repeatedly encourage mothers to leave their newborns outside on the balcony (but wrapped in blankets in the stroller or baby carrier) for an hour a day during the dead of winter. They say it strengthens the lungs and builds resistance to disease. Yes, the pressure to conform sometimes feels a bit stifling for me as an American, who’s been steeped in independence and individuality as a core cultural value. However, considering the current state of affairs in the U.S., I think I much prefer living in a place where it’s less about “me first, and screw the other guy” and more about “we’re all in this together.” Like you, I’m definitely engaging in the count-my-blessings exercise right now that in Norway, it’s really important that everyone have a similar quality of life (equal pay, nationalized healthcare, free advanced education, etc. ), even if that’s occasionally tinged with a more rigid group mentality.